Wirelessly monitor and control compatible solar charge controllers via Bluetooth. Connect to user-friendly smartphone app, Renogy BT, to keep track of your system. Embedded exclusive Bluetooth chip with high efficiency and low energy consumption. With Bluetooth 4.0 and BLE technology, it features fast and uninterrupted communication. Powered directly through RJ12 communication port. Signal range is up to 50 ft. The Renogy BT-1 Bluetooth module is a great addition to any compatible Renogy solar system. Capable of connecting to select Renogy charge controllers through the RS232 port, the BT-1 is used to pair charge controllers with Renogy's remote monitoring app, Renogy BT. 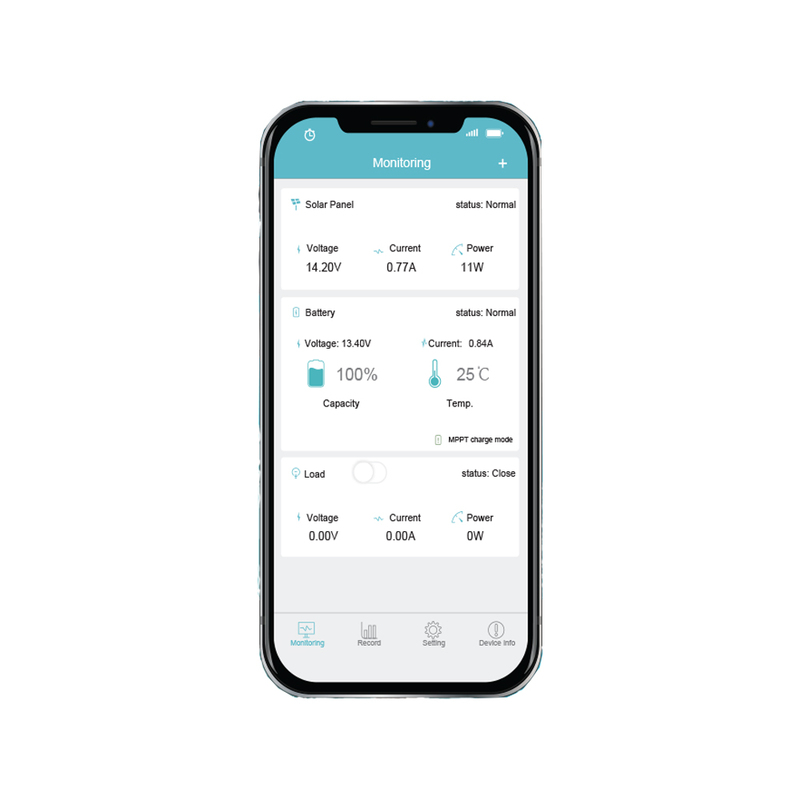 Available for smartphones and tablets, Renogy BT allows for remote monitoring and parameter changes directly via the app. Take the guesswork out of system monitoring by using the BT-1 to view real-time performance without having to leave your seat. At the moment, the Renogy BT-1 Bluetooth module is only compatible with the 30A Adventurer-Li, Rover-Li, and newer versions of the 20A and 40A Rover Charge Controller. Please note that the Bluetooth app, Renogy BT, is optimized for Rover Charge Controllers from version 010407 and onwards (i.e. 010408). The app is not fully compatible with older versions of the Rover Charge Controller such as version 010403 or 010400. Works and gives all the info I Need! Super easy to set up and easy to use the app. Running it on my small 400 Watt system running my router and computer, so far it seems to be working great, like it better than old C35. Bt-1 works great only thing I notice is the temperature sending unit Only read Celsius not F but that's OK. Great product !!!!!!! I ordered the 40 amp Rover without the Bluetooth, but then found that I needed an external connection in order to make needed adjustments for my specific Lithium battery setup. So I ordered the BT-1, and it showed up in the mail just 2 days later. Plugged it in, downloaded the app and it worked flawlessly the first time. Literally plug and play on my 40 amp Rover Charge controller. Download the app, plug in the Bluetooth module and you will be up and running in less than 30 seconds. You will instantly unlock the last 60 days of charging data. Also, the temperature parameter on the Bluetooth sensor updates many minutes faster than the charge controller. More information available on the Bluetooth dongle than on the charge controller. Very nice way to remotely monitor, program, and control your charge controller.